Buy Singapore Dollar Online in India! How To Buy Singapore Dollar in India? Why Buy Singapore Dollar Online via ExTravelMoney? Being a Foreign exchange marketplace, every money changer competes with others. They will offer you the best rate, so as to get the order. Be guaranteed to get the best buying rate for Singapore Dollar. SGD rates can fluctuate dramatically. With Extravelmoney, you can observe and lock the rate when it is favorable. Just pay a small fully refundable rate lock fee & lock the rate for as much as 3 days. 1. How to carry money to Singapore from India? When going to Singapore, you should carry Singapore dollars. This money can be carried as cash or loaded and carried in forex card. You can buy Singapore dollars from banks, money changers in India or visit extravelmoney.com to compare between different banks, money changers and buy forex online from your locality at the best rates. 2. How much Singapore Dollar can I carry from India? A resident Indian can take upto USD 3000 or its equivalent in Singapore dollar as cash and a total of up to USD 10,000 or its equivalent in forex card or traveller’s cheques. The equivalent of USD 3,000 or USD 10,000 in Singapore dollars would be dependant on today’s Singapore dollar rate in India. 3. Which is the best forex card for Singapore? Different banks and money changers provide forex cards with different advantages. Some may have no activation fees, some may have no ATM use abroad fees etc. To choose the best forex card for singapore, compare the various cards offered by banks and forex centers in India through extravelmoney.com. Select a bank or money changer offering forex card at the best exchange rate and book your card online itself. 4. How much is the minimum currency required to enter Singapore or how much is the minimum show money for singapore? Singapore does not mention any minimum currency requirements officially. However, on average, travellers to Singapore would need to carry SGD 100 per day of stay. So if you are going for 3 days be sure to have at least, SGD 300 with you. Also, you need to show proof of accomodation (hotel booking) and a confirmed return flight ticket. Follow these rules to get through immigration in Singapore without much hassles. 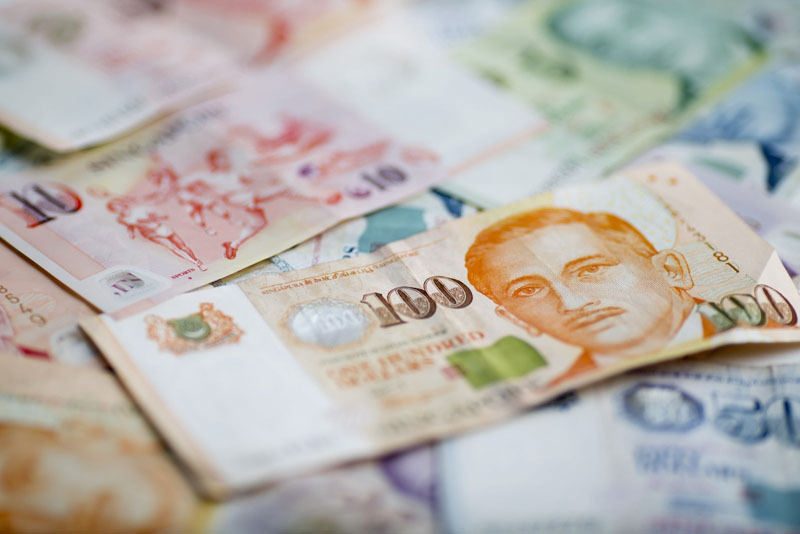 The Singapore dollar is best currency to use in Singapore. It is the official currency of Singapore and is accepted by everyone in the country from street stalls to shopping malls. Alternatively, you can also carry US dollar to Singapore and get it exchanged there for the SGD. While the US dollar won’t be accepted everywhere in Singapore, it may be accepted in major shopping centers. Even when it is accepted the exchange rates you’ll get for them won’t be great and will work against your wallet in the long run. It is better to exchange your US dollars for Singapore dollars at one among the many banks and licensed money changers that can be found throughout the country. 7. Do I need cash in Singapore? Yes. Even though Singapore is one among the most developed countries in the world, your debit/credit or forex card may not be accepted in every business establishment. Hence you will need cash when you go to Singapore. Make sure to buy Singapore dollar currency before you go on your trip. 8. How much Indian currency can I carry to Singapore? You can carry a maximum of INR 25,000 as cash to Singapore from India. As per RBI rules, a resident Indian is allowed to carry up to Rs 25,000 as cash from India to abroad. Please Note : This limit would not be enough for your Singapore trip. Also, you might not be able to exchange your INR to SGD after landing there. Hence, it is recommended that you convert your Indian rupee to Singapore dollar in India itself before going to Singapore. 9. How to use Indian debit card in Singapore? You can use your Indian debit card in Singapore if it is enabled for international transactions such as cash withdrawal from ATMs and swiping at PoS machines abroad. Call up your card issuing bank’s customer care and check if international transactions are possible using your debit card. If the facility has been enabled, then you can use it in Singapore without any issues. Please Note : We highly recommend you use a forex card instead of a debit card when going to Singapore. Forex card has many benefits over debit card and will help you save money in the long run. 10. Are credit cards accepted in Singapore? Yes they are accepted. If you have an international credit card, then you can use it for your purchases, paying hotel bills etc in Singapore. Please Note : Credit cards may not be the best option for you to carry money abroad. Instead forex cards have many advantages over credit cards that’ll help you save money on your trip abroad. 11. Which to use, cash or card in singapore? You must carry both cash and forex card when travelling to Singapore. Singapore is a developed country where you can find ATMs everywhere. You can use your forex cards to withdraw cash from ATMs. Also, most shops and hotels in Singapore have PoS machines where you can swipe your card to pay for your purchases and bills. Thus it makes sense to carry just 30% of your total Singapore travel budget as cash and the rest 70% in forex card. Please read about the best way to carry money when travelling abroad from India.